This is the outline of the walks on the Spine of England II Tour. The outline describes the start, the route and the end of each days walking. Walk planning was done by JJ, Colin, Boff and Graham. As always on these walking tours, everyone was responsible for arranging their own transport to where they join the walk and from where they leave the walk. As John was unable to walk this time (see this video), he became more aware of the efforts people put in to be able to both join all or part of each days walking and to be at the gig in the evening. He is very grateful for the support shown on these tours. Although many of the lunch stops were at a pub or a cafe, this was the bank holiday weekend and lunch stops were going to be very busy so everyone was asked to please bring a packed lunch or pre-order if that is possible. On most days, there was time for a drink (of course). – all day was 20 miles. The first being 11.5 miles to the Whitehouse pub and the second, afternoon, section being 8.5 miles into Hebden Bridge. The walk started around 5 miles to the west of Holmfirth where the Pennine Way crosses the A635. Walkers met at 9am at the car park just off the A635 beyond Wessenden Head and 17 left at 9.15. (see this video). After the first 8 miles, the route along the Pennine Way crossed the M62 at junction 22 with the A672. There is a car park on the A672 just south of junction 22 so that people could arrange to leave at this point if they wished. Walkers arrived for lunch at The White House pub (on the A58 Halifax Rd). 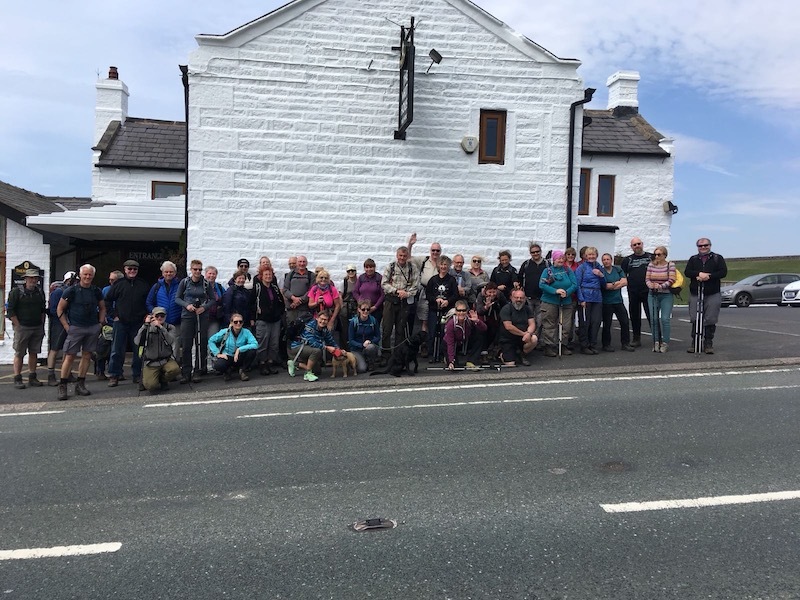 More walkers joined at the pub then leaving at 2.30, the route followed the Pennine Way to Stoodley Pike Monument then left the Pennine Way at Swillington to walk into Hebden Bridge. – all day was 22.5 miles: 11 miles in the morning to Stanbury for lunch then 11.5 miles in the afternoon, meeting up around 5pm in Saltaire at the Boat House Inn by the river. 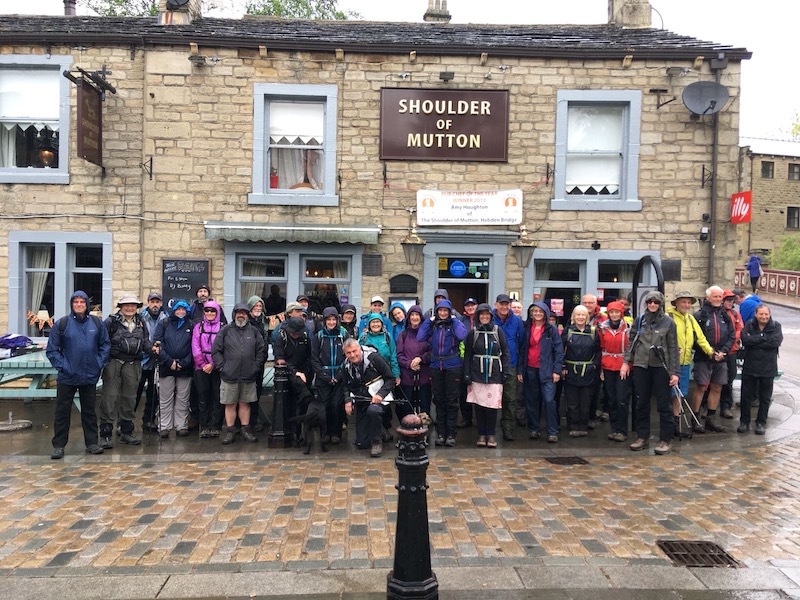 Walkers met at 9am outside the Shoulder of Mutton pub in the square to leave at 9.15. It was raining. The route left Hebden Bridge going north then north west up Hebden Dale and across to the Pennine Way and then on to Stanbury and Haworth for lunch at the Old Sun Inn where some very wet and tired walkers were met by friends and the very helpful hosts at the inn who provided a box of towels for walkers to dry out with. With an hours warning, they also prepared a reduced menu to allow people to order food. As we were such a large group and it was raining, they also allowed walkers to eat their packed lunches in the pub. John, Boff and Colin considered calling off the afternoon walk but enough people wanted to continue that Colin and Boff led a small group to continue walking to Saltaire. – morning was 8.5 miles and afternoon 7 miles giving total of 15.5 miles. 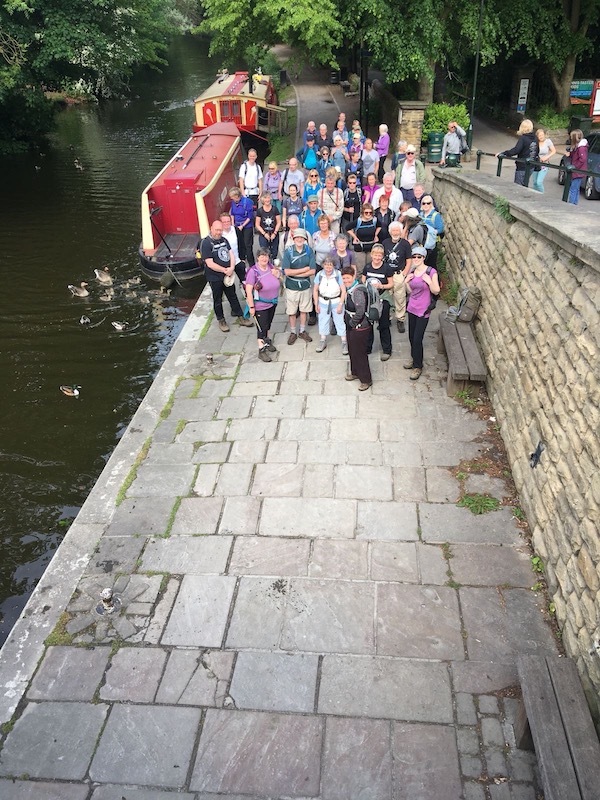 Walkers met at 9.30 at the Boat House Inn by the footbridge near Salt’s Mill and walked up and out of Saltaire on the Dales Way to reach the real summit of Ilkley Moor, then via Desolation Valley and down to the Cow and Calf cafe for lunch. After lunch, they walked to Menston, a section of ginnels and streets, before ending up at the top of the Otley Chevin ridge, descending to arrive in Otley for a drink at the Horse and Farrier (just around the corner from the Court House). – Total of either 17 or 12 miles. There were two choices in the morning: the hill walk or the riverside walk, with the aim of everyone joining together at the cafe at Bolton Abbey for the afternoon walk into Appletreewick. 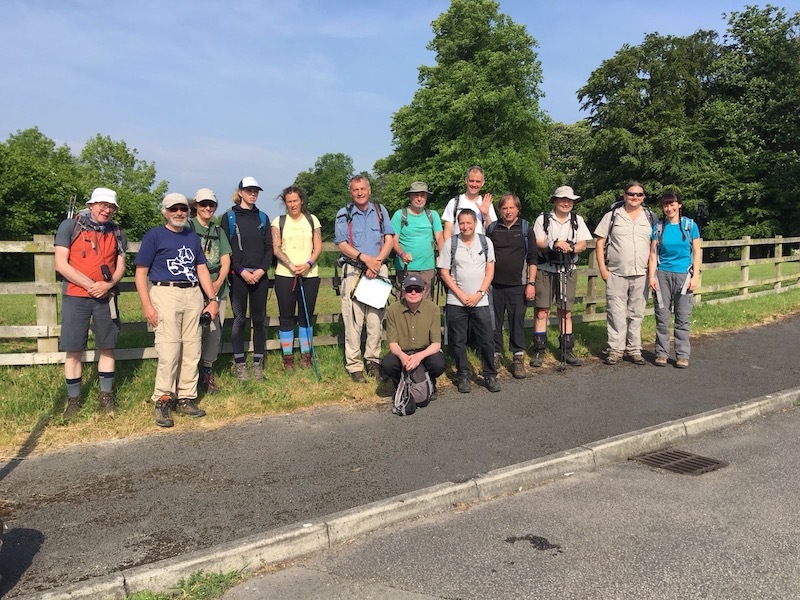 The morning hill walk was 11 miles, starting from the main A65 road at Burley-in-Wharfedale, two miles west of Otley, where there is parking alongside the road at the junction of Burley’s Main Street and the A65. 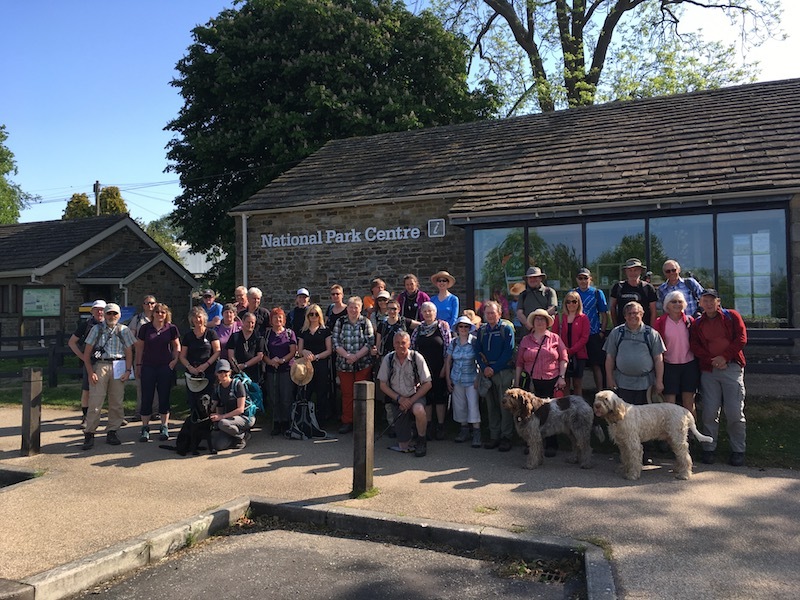 Walkers met at 9am to leave at 9.15 and taking a footpath that leads across the main A65 and the river Wharfe (via stepping stones – those who were fearful of slippery stepping stones could join the party at Askwith village, half a mile north of the river). They then walked through fields and farm tracks up and onto the higher ground. The walk continued up to Beamsley Beacon for panoramic views before descending and walking to Bolton Abbey. This was a long morning walk. The morning riverside walk was 6 miles and was led by Graham. 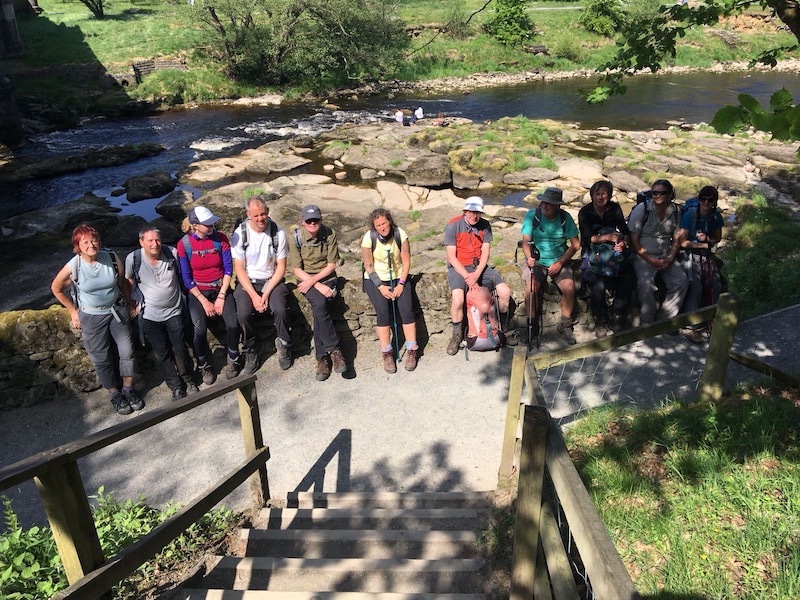 Walkers met in Addingham at 10am and followed the Dales Way along the river Wharfe to Bolton Abbey. The aim was for everyone to meet for lunch at the cafe on the river at Bolton Abbey (The Cavendish Pavilion at Bolton Abbey ). However, the riverside walk was short and the hill walk long. The riverside walkers set off from Bolton Abbey before the hill walkers arrived. The afternoon riverside walk was another 6 miles and followed the river Wharfe to Appletreewick. 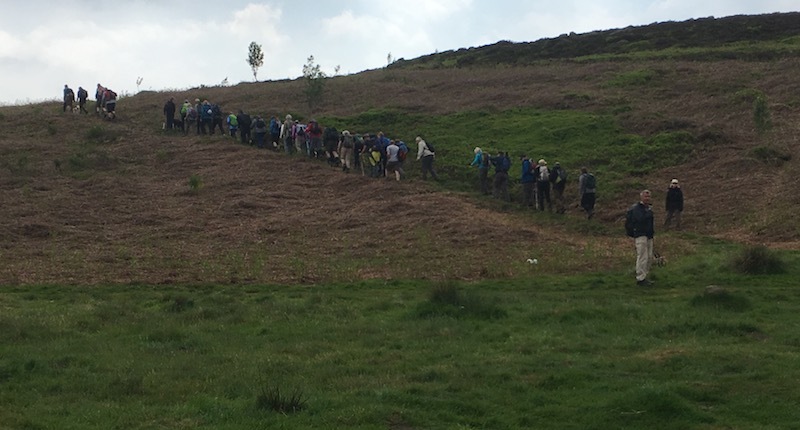 Those on the morning hill walk set off later and everyone met for a drink and a meal in the Cruck Barn of the Craven Arms which was followed by an evening session. – Total of 15 miles – 7.5 miles morning then another 7.5 miles in the afternoon. 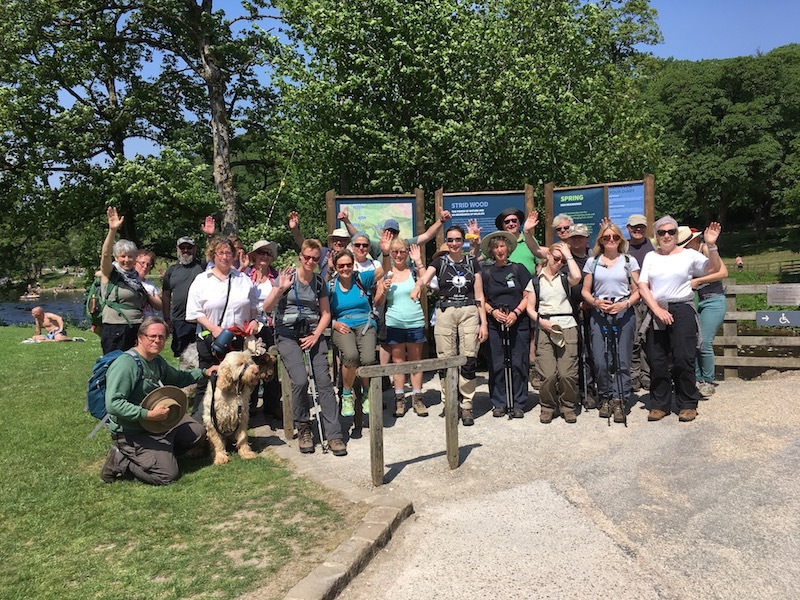 This day the walk started from the information centre car park in Grassington (National Park Centre, Colvend, Hebden Road, Grassington, North Yorkshire, BD23 5LB). 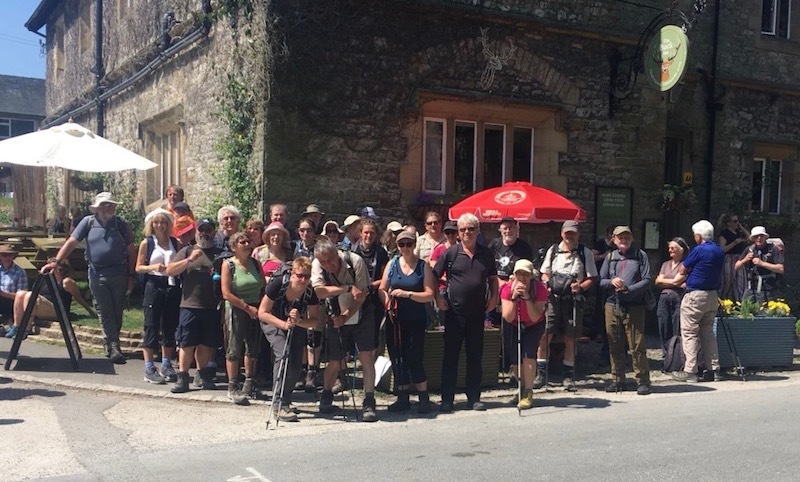 Walkers met to leave at 9.30 and arrived at Malham for lunch at the lovely Buck Inn. 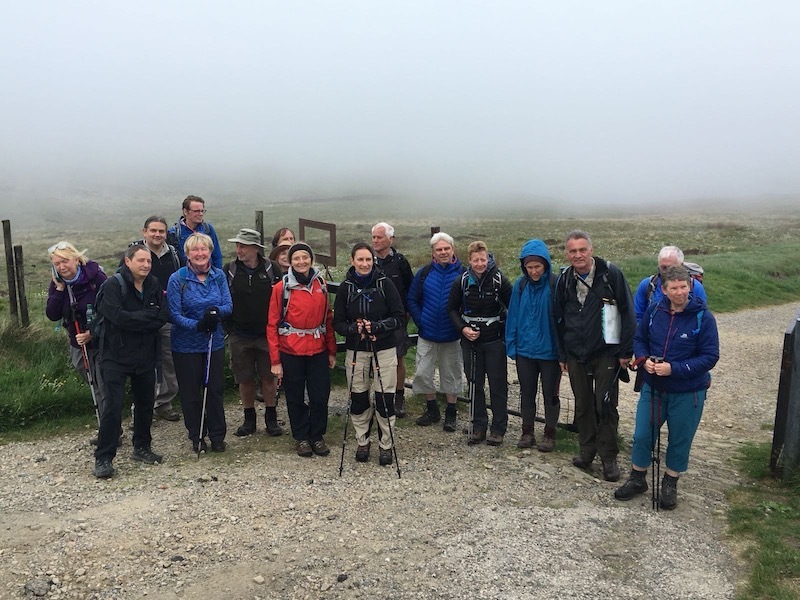 Everyone left at 1.30 to walk to Malham Cove and along the Dales High Way to Settle for a drink at the Golden Lion pub.